The Jatakas is a voluminous body of literature that belongs to India concerning the previous births (jati) of the Buddha. India has always had a rich tradition of oral storytelling, which technique is made use of by various religious preachers to spread their beliefs. 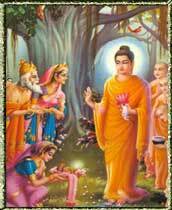 According to folklore, Buddha often recited stories from his past lives to teach his disciples the right conduct of life which came to be compiled as the Jatakas. Therefore the Jatakas are Buddhist parables and tales of Buddha in his previous lives (when he was called Bodhisattva or Buddha- to-be), which included incarnations in the form of a snake and an elephant. The Jatakas reflect the travails and experiences that Buddha underwent to attain the wisdom. They are popularly believed to be pearls of wisdom as they are supposed to be from the mouth of the Buddha himself. There are a number of forms of Buddhism, including the Mahayana Buddhism often practiced in China, Vietnam and Korea; Zen or Chan Buddhism that is often associated with Japan; as well as Tibetan forms of Buddhism. The Jatakas are not a universal component of all forms of Buddhism. They are primarily associated with Theravada Buddhism, which is today practiced predominantly in Sir Lanka, Myanmar, Thailand, Cambodia and Laos. As of today, there are a total of 547 extant Jatakas arranged roughly by increasing number of verses. But there are indications that the actual number of Jatakas could be 550. According to Professor von Hinuber, only the last 50 were clear to understand without any explanation. Folklorists are interested in these explanations in the form of short stories. The Cariyapitaka, another book of the Pali Canon contains alternative versions of some of the stories. A number of individual stories can also be found scattered around other books of the Canon. 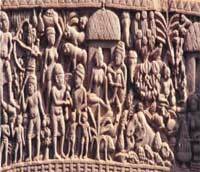 Many of the stories and motifs found in the Jataka are also seen in numerous other languages and media like the Hindu Panchtantra, the Sanskrit niti-shastra etc. giving rise to the suggestion that many of the stories and motifs are translations from the Pali (the language in which the texts of the Theravada school of Buddhism is preserved) and others are instead derived from vernacular oral traditions prior to the Pali compositions. The Buddhist principles found in the Pali Jatakas are widely seen in Sanskrit Jataka (the Jatakamala) and Tibetan Jataka stories. However, significant amendments have been made in the translation into Persian and other languages to suit their respective cultures. Several later compositions of made-up Jataka tales in Pali tradition are also there, but they are categorized as separate literature from the official Jataka stories. Some of the apocryphal Jatakas show direct appropriations from Hindu sources, with amendments to the plots to better reflect Buddhist morals. In Theravada countries, several of the longer Jatakas are still performed in dance, theatre, and formal recitation to this day, and most of them are associated with particular holidays on the lunar calendar used by Cambodia, Thailand and Laos. The Jataka stories are a method of teaching Buddhists the lessons of karma, samsara and dharma. The overall structure of the Jataka Tales is all about the the cycle of samsara that the Buddha had to experience before reaching enlightenment. He is said to have lived 550 lives - some in human form, some in animal form. His each such life carries a lesson in the form of sa story. The stories of his many lives are known collectively as the Jatakas. A collection of the standard Jakatas of Pali tradition has been translated by several people to be published in six volumes by Cambridge University Press during 1895-1907. It was reprinted in three volumes by Pali Text Society, Bristol. There are also numerous translations of selections and individual stories from various languages. Most of the Jatakas are in the form of folklores with a Buddhist touch. The Jatakas also have a version of the Ramayana which is called the Dasratha Jatakas. The Avadanas, which also form an important part of Buddhist literature, are also closely connected to the Jatakas. The fundamental difference between the two is that in the Jataka Bodhisattva (some of the previous lives of the Buddha) is always one of the characters while any saint can play a part in the latter. This concept of Bodhisattva is central to the Jatakas. However there are many Avadanas, in which bodhisattva is the hero. Another text in Buddhist literature that derives heavily from the Jatakas is the Sanskrit work Jatakamala (meaning garland of birthstories) by Aryasura. A collection of 34 Jatakas, it is a work of high literary standards. Stories similar to jatakas occur in the Vedas. Some of the Brahmanas and Puranas are simply narrative stories. In many cases, the context, the style or the core theme of the story is altered. In some cases the same story is told in different forms by different authors. Kausilumina and Kasadavata as poetry and Kabavati as drama are based on Kusajataka.In Mahayana literature there are many Jatakalike stories such as Asvaghos's Sutralankara, Aryashura's Jatakamala and Khsemendra's Avadana Kalpalata etc. Indian Sanskrit works like Katha sarit sagara, Dasa Kuamara carita, Panca tantra and Hitopadesa contain similar stories. These stories contributed to the later incomparable works of Kalidasa and Ashvaghosa. There are also Mahayana jataka stories such as Vyaghri, Dhammasondaka and Seta Gandha Hasti which do not appear in Pali at all. Some jataka stories can be found in Jain literature, such as the story of Isisinga in Suyakadanga, which is the Nalini Jataka. They are found in even the Mahabharata, for example Rsissringa upakhyana. The literature of countries like Persia, China, Arabia, Italy, Greece, Britian and Japan have borrowed ideas and themes from the Jataka and similar other stories.In format the stories are similar to the Panchtantra and lead up to a moral. Here again the morals are bigger than the stories. Jatakas tales holds a treasure of wisdom in them. The essence of these stories lays emphasis over the law of Karma which states that every being becomes what he makes himself. Karma, here, means the actions and includes all the causal connections between these actions and their consequences. The Buddha revealed the inner complexities of karma’s workings, and pointed out that one can, change the course of one’s life, by understanding the nature of karma. He also taught that karma does not unfold in a simple manner with a single cause giving rise directly to a specific effect. The good do not always immediately prosper and the evil do not immediately pay for their sins. Yet, over many lifetimes, every one gets what he deserves. The underlying revelation behind the Jataka stories is that the Bodhisattva too achieved Buddhahood after he had accumulated enough good karmas over a period of many births. Another key to Buddhism are the four noble truths - the ideas that came to the Buddha as he reached Enlightenment: (1) All life is mired in suffering, (2) All suffering comes from desire (for objects, attention, wealth, etc. ), (3) There is a cure for this suffering, which is the elimination of desire and (4) This can be achieved by following the Eightfold Path. Teachings of Jatakas The Eightfold Path - the path that the Buddha prescribed for the elimination of desire, and thus of suffering: (1) Right Understanding or Perspective, (2) Right Thought, (3) Right Speech, (4) Right Action, (5) Right Livelihood, (6) Right Effort, (7) Right Mindfulness and (8) Right Concentration. 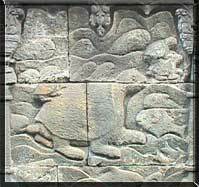 The Jataka stories deals with the concepts like kamma and rebirth and emphasises the importance of certain moral values. The tales are a huge source of wisdom. They have had a profound influence over mankind since time immemorial and they find reflection not just in Indian literature, but also the literature of the whole world. All Jataka stories hold out advice on developing moral conduct, good behavior and they teache us how to correct our ways. They played and continue to play a vital role in the cultivation of peace and generosity. Jataka stories took a prominent place in primary education in Buddhist viharas. Jataka stories speak eloquently of those human values, which contribute, to harmony, pleasure and progress. These stories are ever more relevant in the fragmented societies of today, where especially children, in their most formative years, seek helplessly for guidance in steering their lives to success and fulfillment.